Our road trip to Williamsburg Virginia was a blast. We left here early on the 6th of July and did not arrived on our destination till late in the afternoon. As we were approaching the hotel vicinity, we passed by a fenced in property with horses. So when we had our rest, we went out the hotel and walked to the place where we saw the horses. Our daughter's birthday is perfect for road trips and that's what we always do for a few years now instead of having a party, we do take time to go out on the road and explore a place we have never been to. They wanted to see Busch Garden this year so that's why we went to Williamsburg. It was beautiful out there although super humid. The horses were very friendly, they were in the middle of the fence gracing but when they saw us, they came and greeted us. This one here is very friendly. The kiddos named him Prince. We gave him an apple and he gobbled it in no time. Just being together on the road is fun for us. The kids are great travelers, they make sure to entertain themselves while in the car. Our son can be a little too much for our daughter to handle sometimes but they do compliment each other. I don't think one will be happy without the other. I can't believe our daughter is 11 years old! It doesn't seem like it's been that long since I became a Mom! I thank God everyday for the gift of Motherhood. Here's how entertaining this little lady can be on the road. We were listening to the msong "I can't feel my face" but it got muted on youtube due to copyright issue so I replaced with this music. Happy birthday to your daughter!! What a fun way to spend a birthday, road trips are always fun to do! This looks like a great way to spend the day together. We love road trips. We have 3 toddlers so they can be a little less enjoyable these days but I'm thinking about heading out on one with just the big kids this weekend! What a great adventure! i have never been there before, but it looks like a great experience! Your daughter is way too cute! It makes for fun ride! Looks like your daughter had a great birthday!! I'm glad y'all were able to have a great day as a family also! This is such a great way to spend a birthday. I'm a huge fan of trying new things and creating memories over parties. Horses! What a great adventure. I have been taking quite a few road trips this summer. I am about to head out on another one to Indiana to a friends ranch / farm. I can't wait to ride the horses. I really love you travel during her birthday instead of a party. It is awesome when you can travel each year together as a family. The video is so cute and they both do really entertain themselves. Thanks for sharing your experience and Happy birthday to your daughter. Williamsburg is such a great place to visit! What beautiful horses you found nearby. I bet your daughter had a wonderful birthday. What a great trip to take with your family! I love Virginia, it's a beautiful place FULL of history! What a fun trip with the family. We have yet to travel to Virginia, but it looks marvelous. What a wonderful place to visit. We also have started to do family events for birthdays because they are so much more memorable. That sounds like a lot of fun. Looks like everyone enjoyed it too. I love seeing horses, and so do my girls. I hope your Daughter had a great birthday. Busch Gardens is a great place to go for a birthday. I love a good road trip. It looks like your daughter had fun and will look back on her birthday as an awesome one! What a great adventure! I just love horses. Years ago we had a backyard that went right up to a horse pasture. They would come to my fence and I would spend a lot of time petting them. Time does fly when we're having fun, huh? I can't believe that I have a teen either. :) Happy Belated Birthday to your pretty daughter! It looks like you all had a ton of fun! i love family trips! How fun! I love that you guys take trips instead of parties! 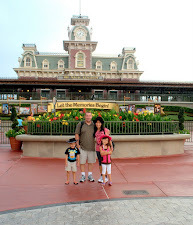 We do the same and the traveling and exploring as a family is so worth it! Wow it looks like you all had a blast! Those horses are so beautiful and looked so friendly. That looks like a lot of fun, and what a beautiful horse! I could really do with a good road trip soon. Belated Happy Birthday to Rylie! I think roadtrips are really fun too and it's also one of our ways to celebrate a birthday.